Embrace a #naturalsummer with the August issue of Healthy, which helps you maximise the wellbeing benefits of summer. We’ve rounded up everything you need to know for your summer holidays, including your summer beauty 'capsule' bag, plus why being outside = a natural happiness boost. Also, we've rounded up a whole list of salad supper under 300 calories to keep you trim, plus the best veggie burgers to enjoy at those BBQs. Read all about it – we chat to Sadie Frost on why she's swapped late night partying for morning yoga, and we catch up with Delicious Ella in her regular column. 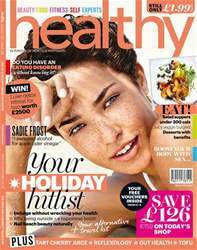 Find out more in the brand new issue of healthy. Below is a selection of articles in Healthy Magazine August 2017.